It’s been hot in the Pacific Northwest. There are hot fires going on. The temperature is hot. And, most important the summer steelhead fishing is hot, particularly on the Cowlitz River where we’ve been catching a lot of fish. With all of the focus on salmon the Cowlitz has flown under the radar in recently weeks. Meanwhile, we’ve been taking advantage of the constant action. As expected, summer steelhead conditions spell low summer flows. 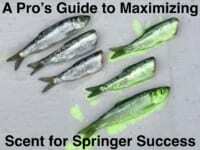 To combat this important to employ small, quality baits. It’s imperative to have small baits tough enough to cast into fast water, hold their color and most of all maintain an irresistible color. We learn something new each year. This summer, however, I’ve been re-brining my eggs to ensure success. 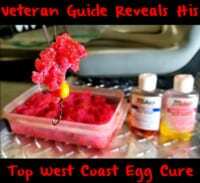 By re brining cured eggs I’m able to cut them into dime-size pieces, bring out an iridescent pink color and make them juice without losing their color. It’s a process that’s easy to do and has been catching limits of steelhead consistently even in the heat of summer. Step 1: Mix Fire brine, BorX O Fire, salt and sugar into a two-quart container. Step 2: Add eggs and shake well. Step 3: Shake or roll around every 10 minutes. Step 4: After 30 minutes take eggs out of container, put into a strainer and let dry to a nice firm egg. Step 5: Cut eggs into dime-size pieces. I rig the re-brined eggs on a #2 hook and use a five-foot Maxima Fluorocarbon eight-pound leader. Also, you’ll notice I listed the red and pink colors of each. If there is more color in the water I like the red better (that means mixing the Red Fire Brine and Red BorX O Fire, but when it’s clearer I like the pink. Most days I’ll fish both of them. I never tell the fish what they want. I let them determine what they want and then put it out there. This time of year steelhead can be found in riffles and faster water. They aren’t necessarily in deep water rather fast water. It’s important to find the quicker water and broken surface stuff. I’m catching them from two to 6-8 feet. They don’t want the slow, deep stuff. The entire river is holding steelhead right now. Obviously closer to the hatchery on the weekends is busier so we’ll drop down, but overall there’s fish everywhere in the system. Steelhead fishing is spectacular right now and it’s going to be like this for at least a month. There’s still fish pouring in. And, all the sudden there’s fewer people showing up because they are going everywhere else as fish come in, like Buoy 10, etc, but this fishery will be strong well into September. Editor’s Note: Bob Kratzer operates Anglers Guide Service. For more info on his Cowlitz River summer steelhead trips please visit http://www.anglersguideservice.com.